This is, hands down, the best end-of-summer meal you can prepare in your kitchen and I’ll tell you why in the paragraphs below. 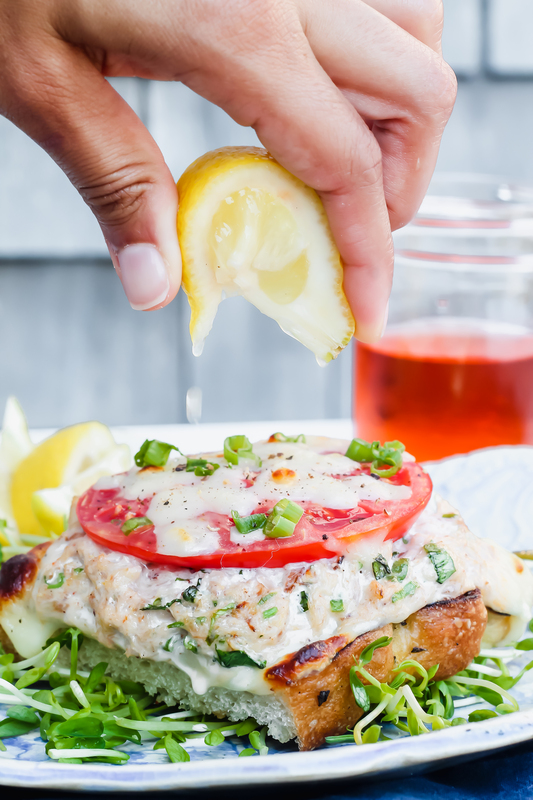 Now let’s dive into the world of Deviled Crab Melts! This is a sponsored recipe on behalf of Land O’Lakes + The Feedfeed. As a chef at a seasonal restaurant on Martha’s Vineyard, where the season is one long and difficult one, working 16-hour days and never having a day off together with your husband (who I also work with thankfully, so at least we see each other at work), Labor Day signifies the end of that crazy, non-stop schedule. We survived Labor Day. We made it without losing our cool and without passing out in a hot kitchen (although I was close). It signifies that we now live a life where we have Mondays, Tuesdays, and Wednesdays off from work – what a dream! What does that have to do with these Deviled Crab Melts? Well everything, actually! Because now with three days off, we can cook for friends and family and we can shop the farms and markets and still buy these gorgeous heirloom tomatoes from Morning Glory Farm. We can dine on the deck and sit on the outdoor furniture we bought in May that we’venever had a chance to even relax in! 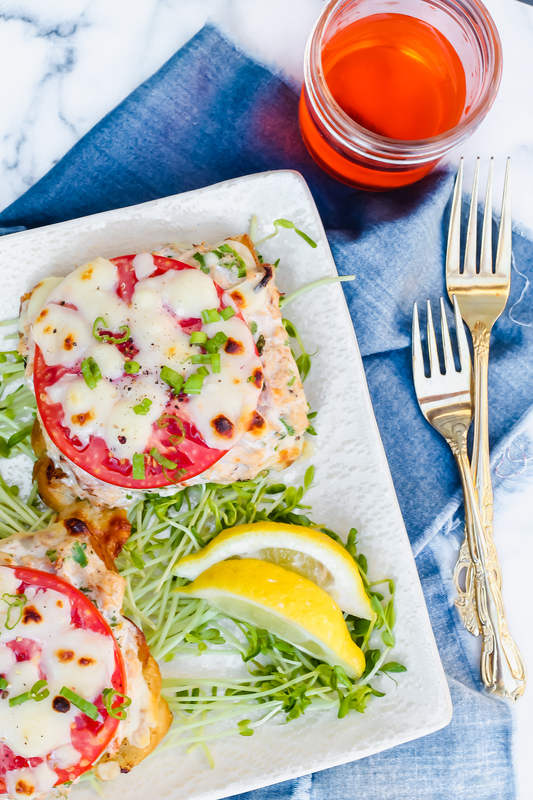 These Crab Melts signify a freedom unlike any other and I’m so excited to share this delicious recipe with you, thanks to Land O’Lakes® + The Feedfeed. The ingredients are simple: Grab a fresh loaf of bread and a few heirloom tomatoes from the farmer’s markets. Head to your neighborhood grocery store and grab a can of crab meat (pricy but well worth it!) and then walk over to the deli counter because Land O’Lakes® Deli American is sliced fresh to order meaning the product you take home is always top notch & the reason why it is America’s #1 Deli American. I mean, we’ve been buying it for the past seven years that we’ve been married (my husband and I love a good late night grilled cheese snack!). Then you just need a few extras like herbs, mayonnaise, and hot sauce that I’m sure you have at home! Granted this is a sponsored post, but in all honesty the love for Land O Lakes® Deli American cheese is a real one. The taste, creaminess, versatility, and meltability are what make it stand out from other brands. Living in New England for the past eight years has really been a blessing and there’s no where else I’d rather be, so I wanted to create a sandwich that reflected my location. Martha’s Vineyard, a little island about 2.5 hours from Boston, is where we call home and is also home to some of the best seafood dishes in the world. So why not recreate that feeling of home in a sandwich? 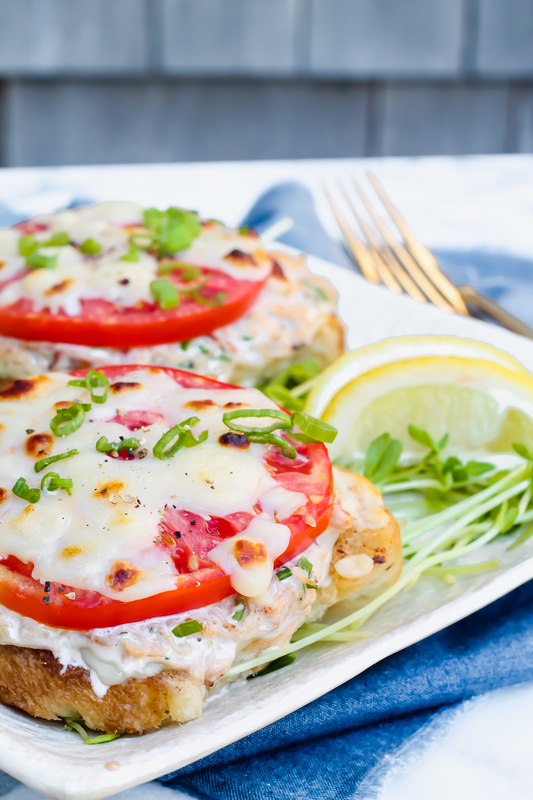 These Deviled Crab Melts are sure to became a favorite of yours because of how easy they are to put together and at the same time, how delicious they are! Let me know in the comments if you make them and join me in celebrating the end of summer! 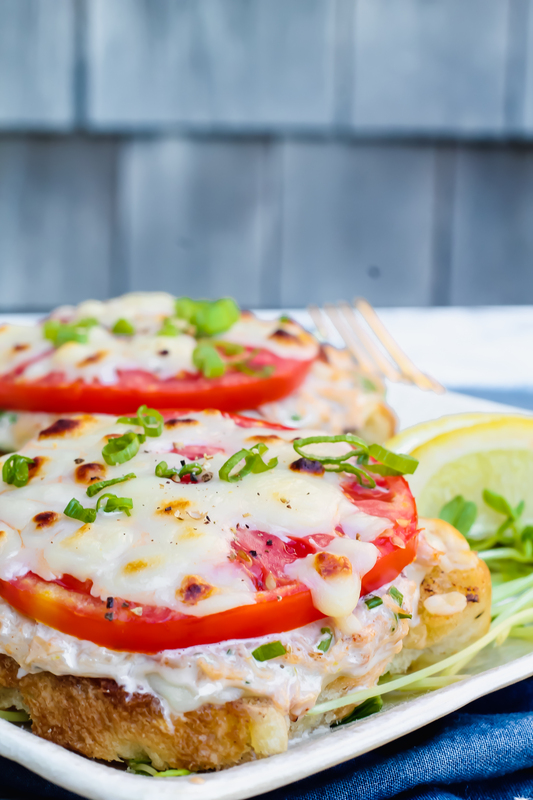 These Deviled Crab Melts - with a hint of spice and fresh herbs - are one of my favorite meals! In a large bowl, mix the crab meat, mayonnaise, herbs, and hot sauce. Season with salt and pepper. Let the crab meat sit for 10-15 minutes and in the meantime, toast the slices of bread and butter on both sides. Place on a baking tray. Place a full slice of Land O Lakes® Deli American Slices on the top of each toasted slice of bread, then top with a scoop of crab salad and a thick tomato slice. Using the rest of your cheese, cut it into small squares and sprinkle over the top of the tomatoes. Broil until the cheese is melted, sprinkle with black pepper and salt, plus any herbs you have leftover. Serve with a few slices of lemon, atop a salad of greens if desired. Coming to the Vineyard on the 6th for 8 days ! Definitely going to make these deviled crab sandwiches while we’re there !! Morning Glory is right down the street. Nothing beats their fresh produce and pies. Can’t wait to get there !! !